This page is accessible by users with ManageOrgMembers and Access roles by going to Organizations > Manage > Org Members. This page is used to move members in one organization into a different organization. The Source relates to their current enrollment; the Target relates to their new enrollment. You will filter for a list of people enrolled in organizations within a Source Program and Division in order to move the members you select into a different organization. You can specify a Source organization, but you do not have to do so. You then select a Target Division, which can be the same as the Source Division, but it can be a different Division. It just needs to be in the same Program. If you do not select a Target Division, the list of possible Target organizations will be every org in the Source Division. You must select a Target organization into which you want to move those you select. Once you move the members, you can click a button to send a system-generated email with the information about their new class. The move will make the person a current member of the Target Org and a Previous Member of the Source Org. This management page will include Prospects as well. If you move someone with a Member Type of Prospect he will retain that Member Type in the new org. If you are moving just a few people and both orgs are in the same division, you can use the standard move members process without having to use this advanced page. That just requires Edit and Access roles. This page is designed for the uses outlined below. Most churches will use this management page for their yearly Promotion instead of using alternate Annual Promotion method. We have a separate article for using Manage Org Members for Promotion. Parents register their children on-line, which will enroll them in the Vacation Bible School roster for their age group. Staff will use Manage Org Members to move the children into the smaller, individual classroom orgs. You can send emails from the management page, which will contain the child’s room assignment, the org name and leader’s name. Volunteers register online and indicate the area in which they want to serve. Once they have been approved, use Manage Org Members to move them to the specific volunteer organization where they will serve. You can use Change Member Type when Moving to set the Member Type to Volunteer or VIP, and you won’t have to return to each org to make that change. The box Move Registration Data will be checked by default. This will move any questions, sub-groups, and other registration data (not including fees) from the current org to the target org, as log as the groups and questions are the same. Remove the check mark if you do not want to retain the sub-groups, etc. from the current org. After Promotion, if you need to reassign more than just a few members to other classes, Manage Org Members is the easiest way to do that. If you are moving only one or two people from the same org, you can do that from each person’s Member Dialog or from the Member tab of the organization itself. This type of use is handy when people have registered for a class, and then you need to cancel the class and move them to another one. Select one from drop down list. This is required. These will also be in a drop down list and will be those in the Program you selected. This is required. This is the current org the members are enrolled in. This is optional. This is optional. If you do not select a Division the list of Target Orgs will be all the orgs in the Source Division. This is required and is the org into which you will move the members. Select from drop down, or enter a single grade or multiple grades, separated by a comma or semi-colon to find members with the grade on their people record. It is optional. Enter a single age, or an age range using one of these operators: -, >, <, <=, or <=. This is optional. Select from the drop-down to filter for those in a specific sub-group. If there are not sub-groups in the Division / Org, you will see a message to that effect. If you do not select a Source org, you will see all of the sub-groups for that Division. To find those in multiple groups, select Match All and then select the groups. You can click on most of the headers and sort by that column. The paragraph below explains how to use the Mixed column. This is checked by default and will move any information received during an online registration, as well as any sub-groups that are not part of an online registration. When you check this box, a list of Member Type will display. Select one of these to make that the Member Type of everyone you select and Move. Changing Member Types option is especially helpful if you have volunteers register online expressing their desire to serve in a particular area. Then you use Manage Org Members to move them to an individual volunteer org. You can set their Member Type to Volunteer or VIP when you move them instead of having to return to each person’s record and change it. After moving members you have the option to send an email with their new assignment. This will contain the name of the new class, the leader’s name, and the location. Select the Program and Source Division where you org members are currently enrolled. If they are all in the same org, select the Source org. Now you will see everyone enrolled in those orgs. Use any of the filters / options described above to find the exact members you want to move. Select the Target Division and Target Org. A Division is not required if the Target Org is in the same Division as the Source. Select each person you want to move. If those you want to select are in consecutive order, click the first one; hold down the Shift key, and then select the last one. This will select everyone in-between as well. Verify that you have the correct Target and the correct members selected. If you are changing the Member Type during the move, check that box and select the Member Type now. Each refresh of the page will remove the check mark, so you do want to do that earlier in the process. Click the blue Move button and wait for the message letting you know that the move has been completed. Click Email Org Assignment Notices button to email everyone his new class information. The number in parentheses in the email button is the number of people who have been moved. You can send those each time you move members, or you can wait, move several batches of members and send the email to all of them when you are finished. To do that, just check Email All? before sending the email. If you are starting over moving a different set of members, your System Admin can use the drop down beside the button to Reset Email Notices . This will start tracking the changes again from that point, and not send any notices to those moved prior to that. The email itself has default text that includes the person’s name, name of the new org, it’s location, and the new org’s leader. If you want to change the email, your System Admin can do that. The email is named OrgMembersModel_SendMovedNotices and is in Administration > Setup > Special Content and is on the HTML Content tab. Here is what the default text looks like. It contains special Email Replacement Codes that will populate with the real data when sent to the member. When you click this header, everyone in your list will be mixed randomly. Then you can select people in order going straight down the list until you have the number you want to move. Your selection will be a representative mix of genders and attendance percentages. This is mainly use for Promotion. Once you move the students, they will no longer display in your list. This is because they no longer fit the filters you selected. If you are moving students who have registered online and you allowed them to make a request (by using that specific question option), their answer displays in the Request column on this management page. You can use Control F to open a find dialog, which will help you find the person requested. This will help you assign both members to the same organization. As you move students into a new organization, you can click Email Room Notices to send the room notice email to everyone who has been moved. In parentheses beside Email Room Notices, is a count of the people who will receive the notice. As you move more students, send the email again. The email will go only to those students who have been moved and who have not already been sent a notice. If you reassign a student after you have already sent the notice, they will be included the next time you send notices. 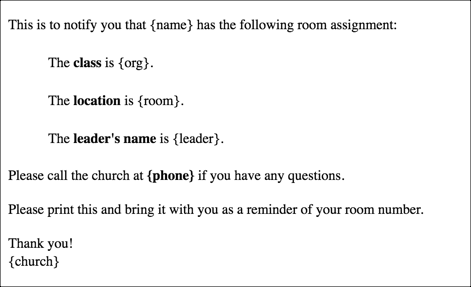 You can also use the Email Room Notices as a second reminder after you have moved everyone. Check the box beside Email All and then click Email Room Notices . If you would like your System Admin to modify the email that is sent, that can be done in Administration > Setup > Special Content > HTML Content by selecting OrgMembersModel_SendMovedNotices and making any necessary changes. If that HTML file is not in the list, send a test move notice (move one individual and send the notice). Then return to Special Content and the email will be there available for editing.